A seasoned food developer to whom food companies turn for help in creating delicious new products, Barb Stuckey reveals that much of what we think we know about how taste works is wrong. And the truth is much more fascinating—for instance, your tongue is not divided into quadrants for sweet, sour, salt, and bitter and only a fraction of what you taste happens in your mouth. 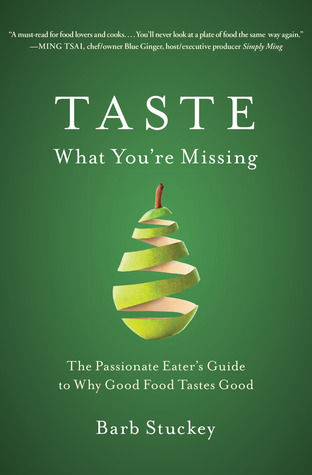 As Stuckey explains how our five senses work together to form “flavor perceptions,” she tells intriguing stories about people who have lost the sense of smell or taste and the unexpected ways their experience of food changes as a result. You’ll learn why kids (and some adults) turn up their noses at Brussels sprouts and broccoli, how salt makes grapefruit sweet, and why you drink your coffee black while your spouse loads it with cream and sugar. Stuckey also provides eye-opening experiments in which you can discover your unique “taster type” and learn why you react instinctively to certain foods, in particular why your response to bitterness is unique. You’ll find ways to improve your ability to discern flavors, detect ingredients, and devise taste combinations in your own kitchen for delectable results. 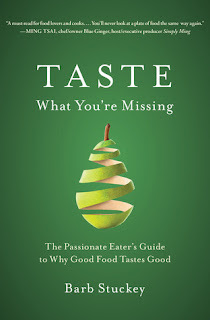 Taste What You’re Missing gives curious eaters, Food Network watchers, kitchen tinkerers, and armchair Top Chefs the understanding and language to impress friends and families with insider knowledge about everything edible. What Harold McGee did for the science of cooking Barb Stuckey does for the science of taste in Taste What You’re Missing, a calorie-free way to get more pleasure from every bite. Barb Stuckey is a professional food developer who leads the marketing, food trend tracking, and consumer research functions at Mattson, North America’s largest independent developer of new foods and beverages. She and her HyperTaster fiancÉ divide their time between San Francisco and Healdsburg, in Northern California’s wine country. Barb Stuckey is a professional food developer and has studied the science behind why certain foods taste better than others and how some foods can enhance or detract for their taste as well. I had a friend in grade school that used to drink orange juice promptly after brushing his teeth which made him vomit. He did this any time he wanted to stay home from school. Although this is an extreme example, Barb Stuckey explains exactly why orange juice tastes terrible after brushing your teeth. I found this whole book fascinating and full of really cool scientific facts about why some food tastes good and appealing while others completely miss the mark. She also emphasizes that our mouth and tongue only provide 20 percent of the experience of taste and that the other senses also come into play, especially smell. There are formulas throughout the book that go into great detail about how foods and spices combine to make the sum greater than the parts. Stuckey also provides experiments for you to try at home and help develop your own taste so you can actually learn how to increase your own potential taste. I never knew there was such science behind food development since on the surface we only tend to look at the packaging. I really enjoyed this whole read and the information included will have you thinking about this for years to come. So interesting! I am into food and how it works - the science of it all. This one is going on my TBR for sure! This sounds like an interesting bookto me. Although I've learnt that my digestive system is intolerant to most of what I like!